White (Balanda) man sitting in the extended grass on the outskirts of town. Bloodshot eyes, tattoos can in hand. Wine bladder crucifix nailed to tree thong on the ground, complete moon behind him. 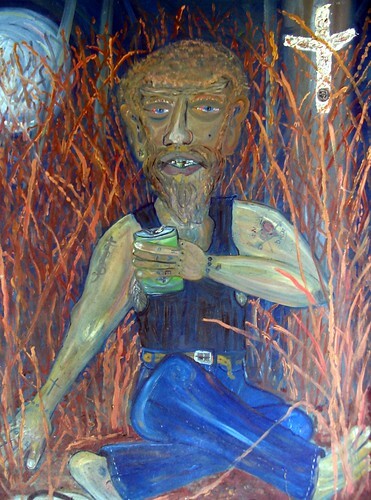 This and the other painting in the series had been submitted to the Darwin show two years ago and rejected. The theme was &quotDarwin Topical&quot. The explanation for rejection was that they had been not &quotin theme&quot. At about this time the evening patrol and police have been quite active in evicting individuals from camps all around Darwin. There remains a large number of vagrants, homeless, travelers, guests with no address, men and women who camp out in the scrub land about Darwin. These individuals, largely Aboriginal, are collectively named &quotLongrassers&quot soon after the Sorghum that grows on the outskirts of town. 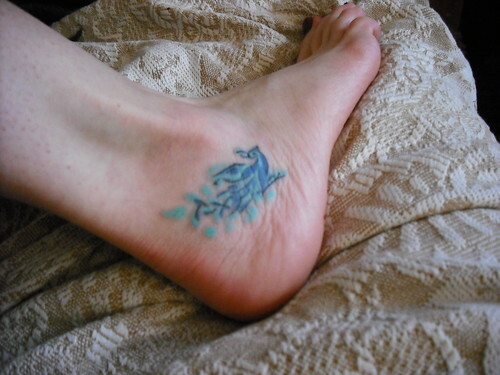 Todays PAD is my new tattoo on my Left Foot. a Moon Bird.